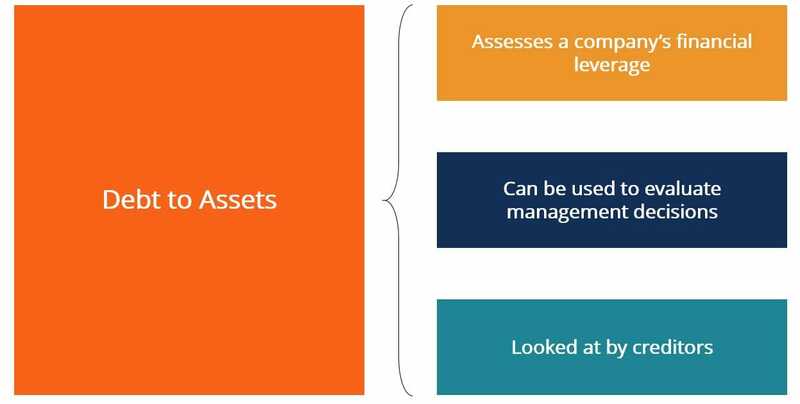 What is the Debt to Assets Ratio? The Debt to Assets Ratio is a leverage ratioLeverage RatiosA leverage ratio indicates the level of debt incurred by a business entity against several other accounts in its balance sheet, income statement, or cash flow statement. Leverage ratios include debt/equity, debt/capital, debt/assets, debt/EBITDA, and interest coverage. This guide has exmaples and Excel template that helps quantify the degree to which a company’s operations are funded by debt. In many cases, a high leverage ratio is also indicative of a higher degree of financial risk. This is because a company that is heavily leveraged faces a higher chance of defaulting on its loans. It is legally obligated to make periodic debt payments regardless of its sales numbers. During slow sales cycles or difficult economic times, a highly levered company may experience a loss of solvencyInsolvencyInsolvency refers to the situation in which a firm or individual is unable to meet financial obligations to creditors as debts become due. Before beginning legal insolvency proceedings, the firm or individual may get involved in making an informal arrangement with their creditors as cash reserves dwindle. The debt to assets ratio can also be thought of as the amount of a company’s assets that have been financed by debt. It can provide insights on past decisions made by management regarding the sources of capital they selected to pursue certain projects. By extension, we can also consider the debt to assets ratio as being an indirect way of measuring management’s usage of its capital structureCapital StructureCapital Structure refers to the amount of debt and/or equity employed by a firm to fund its operations and finance its assets. The structure is typically expressed as a debt-to-equity or debt-to-capital ratio. Debt and equity capital are used to fund a business’ operations, capital expenditures, acquisitions, to fund NPV-positive projects. How can we calculate the Debt to Assets Ratio? 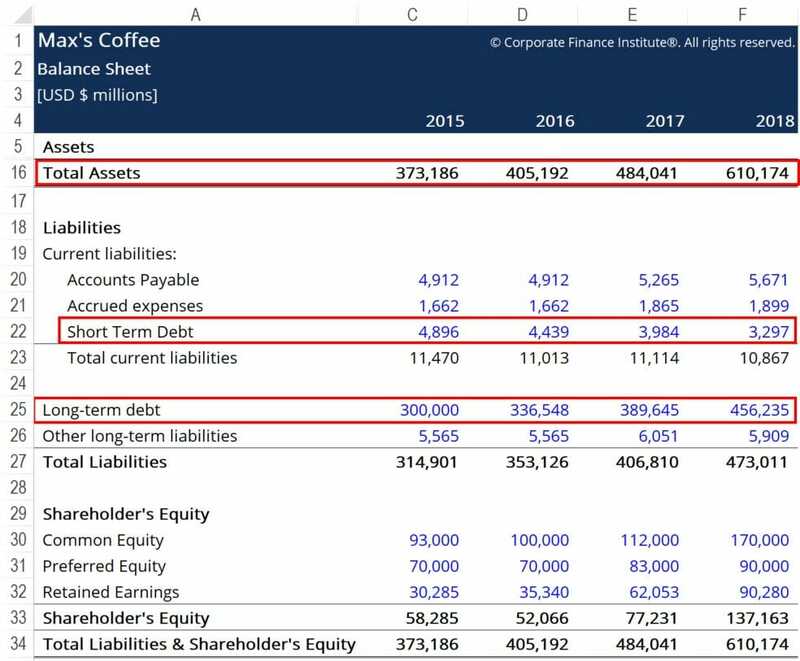 In the example above, we can see that Max’s Coffee consistently posted a debt to assets ratio of over 100%. This shows us that Max’s has more debt than it has assets that can be liquidated in the case of bankruptcy. This would typically be an indicator of poor financial health, as Max’s has a very high degree of leverage. Due to the likely very high periodic debt payments, Max’s is at a fairly high risk of defaulting on its debt. Nonetheless, if the business is able to generate strong and steady cash flows in each period, this position may be sustainable. To better understand the financial health of the business, the debt to assets ratio should be computed for a number of companies that operate in the same industry. If other firms operating in this industry see a debt to asset ratio of, say, over 200%, we can conclude that Max’s is doing a relatively good job of managing its degree of financial leverage. In turn, creditors may be more likely to lend more money to Max’s if the company represents a fairly safe investment within the coffee industry.